The Secret of Getting Ahead? These days, it sometimes seems like if it weren’t for bad news, we’d have no news at all, especially on the economic front. I’ve been thinking about this a lot lately – not the economy per se, but the news, that is, the stories we tell about the economy. I’ll have more to say about this later, but it’s increasingly clear that what we have beneath the headlines are dueling paradigms, different core assumptions of what is good and bad, what works and what doesn’t. Here is a core assumption that never has gotten much air time: altruism rather than self interest may be the greatest motivational force for people at work. This is the thrust of the teaching and writing of Adam Grant, 31, the youngest tenured and highest ranked professor at the Wharton School of Business. Sarah Dominus, a writer for the New York Times Magazine, profiled Grant in a March 27 article, Is Giving the Secret to Getting Ahead?. Grant first made a name for himself in the field of economics as a 22 year old grad student in organizational psychology, when he applied himself to boosting motivation and output at a university fund raising call center, a notoriously unpopular student employment option. Realizing that the call center helped fund scholarships, Grant invited a scholarship recipient to address the callers to give them an idea of the value of their work. Even Grant was amazed when the next month, revenues were up 171%. In later studies, the jump was as high as 400%. Since then, Grant designed other studies in other fields that gave parallel and equally quantifiable results. Grant’s work has drawn criticism as well as praise, much of it centered on the potential for abuse of the findings. Will corporations try to use them to keep workers happy while cutting their wages and benefits? According to Sarah Dominus, Grant is skeptical of corporate motivation as well and says his effort is to understand the mechanism, not necessarily suggest implantation. I started thinking of the how and why of our bad news headlines when Fischer said he remains optimistic. Despite the chaos and breakdowns of our traditional systems, he believes that interactions based on compassionate regard for each other are the future. “Not in my lifetime and maybe not in yours, but I think it’s coming,” he said. That’s why I was so pleased to discover Adam Grant’s work. I don’t often think of economics as a likely field of compassionate action, but if, as the Buddha asserted, it’s an impulse at the core of our being, we should expect to find the evidence everywhere. 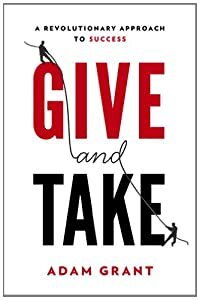 Adam Grant seems to have found it at the heart of “the dismal science.” His first book for a wide audience, Give and Take, was published on April 9. This entry was posted in Books, Buddhism, Economics, News, Psychology and tagged Adam Grant, books, Buddhism, business, economics, Psychology. Bookmark the permalink. 4 Responses to The Secret of Getting Ahead? See, this is why I save your blog posts. If I can’t get to them as soon as they come in, which is often the case, I save them until I can get to them. They always make me think and often make me feel hopeful or satisfied, as this one does. Nothing is as satisfying as doing something that is truly helpful for someone else. This is such a good reminder to focus outward rather than inward to create happiness. Thanks for a great post. I routinely scan online news sources for blog ideas, but not long ago, I realized a side effect is filling my awareness with a lot of bad news. One day when I was feeling depressed, it hit me, along with a motto I’ve quoted here more than once but not recently enough: “The quality of your life is determined by the focus of your attention.” (by Zen teacher, Cheri Huber). That’s the gist of a renewed determination to look more intently for stories I’d like to read and then pass them on. Morgan I was just having a discussion the other day with my 17 year old son about the fact that anytime my focus turns inward are the times I am least fulfilled. He argued that you have to take care of yourself and it’s Ok to do things for yourself so that you can be happy. I tried to explain to him that there is a balance and that obviously if you are not well you can’t really help many others, but that obviously if our focus becomes too self directed we will seek fulfillment but will not find it. At 17 it’s hard to share that and expect that he can grasp it without some time to develop the perspective necessary to appreciate it. Here I am at 50 still on the journey to understanding it myself, :-). I don’t think there are any cookie cutter solutions – the right balance of compassion and wisdom would seem to be different in every situation. I guess the main thing is the intent to do the right thing for something greater than one’s own self-interest.